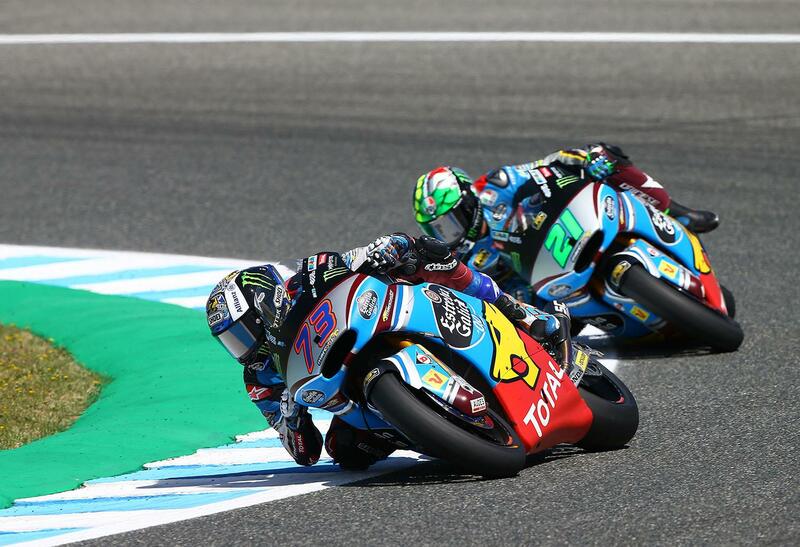 Alex Marquez took a stunning maiden win at the Spanish Grand Prix, crossing the line thrand a half seconds clear of an impressive first intermediate class podium for Francesco Bagnaia. The rider from Cervera was back on the top step for the first time since the Moto3™ race in Motegi in 2014, the year he took the lightweight class crown. Miguel Oliveira took another podium for KTM in third, as championship leader Franco Morbidelli slid out of contention early on. 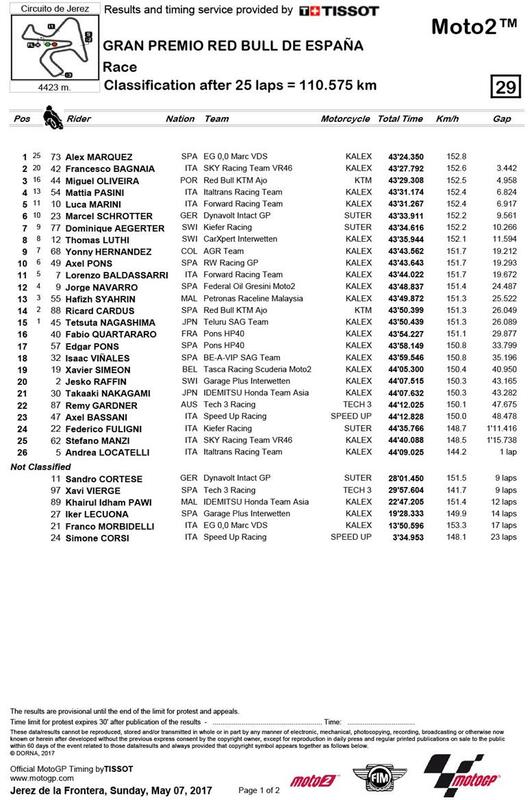 Marquez took the lead out of Turn 1 after a good start, with Morbidelli taking the apex first and then running a little wide – but it was an EG 0,0 Marc VDS 1-2 streaking away at the front as Dominique Aegerter, Mattia Pasini and Xavi Vierge squabbled for third – with Bagnaia then getting up into the fight. A small mistake from Marquez left Morbidelli to come through with 18 laps to go – before drama suddenly hit the lead as the Championship leader slid out and Marquez found himself 4 and a half seconds ahead of Bagnaia on the chase. Keeping it calm and collected at the dead of the race, the 2014 Moto3 World Champion crossed the line in clear air to take his maiden Moto2 win – and in front of the home crowd. With the final laps approaching, Bagnaia had moved through into a more secure second to secure a stunning rookie podium, with Oliveira then hunting down Pasini to take third - the second rostrum for the KTM intermediate class chassis in four races. Veteran Italian Pasini crossed the line in fourth, ahead of Marini and Schrötter.